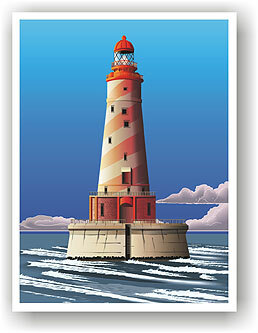 Francis Moran & Associates > Marketing strategy > Why is there a lighthouse on your brochure? Why is there a lighthouse on your brochure? Many years ago, our PR agency had a client for which we did media and analyst relations across North America and in Europe. This matched the market footprint of this rather successful company that was in the document-management space. One day, they sent us the latest version of their new marketing brochure. Internal discussions on it had apparently been going around and around in circles, and they wanted our opinion. “The creative what?” was the response. Thinking maybe they used different terminology, I explained that I was looking for some sort of strategic document written at the outset of the brochure-development project that set out its objectives, the target audience and its level of understanding of the situation, intent, key messaging, tone and style, intended action and whatever else would help ensure that the result was both creatively arresting and strategically relevant. We have no such thing, they told me. Without it, I explained, I really couldn’t do much more than proofread the copy and critique the design from a fairly abstract aesthetic perspective. Although I had a good understanding of their business, their market and their target audience, there was nothing telling me what the brochure was intended to achieve. Consequently, I could offer little meaningful feedback on whether it was achieving that objective or not. There was no clear, objective reason for anything — words or pictures — in the brochure. “Because our VP likes lighthouses,” came the reply. “I guess we should consider ourselves fortunate he doesn’t like little fluffy kittens,” was my slightly intemperate reply in what just might have been the beginning of the end of that client relationship. Here’s the thing: It was absolutely no wonder this company was thrashing around with brochure revision after brochure revision, unable to figure out whether what they had was going to do the job. Because they had no idea what that job was supposed to be. Contrast this with a more recent and far happier experience. A good local agency designed a new website for a company for which I am virtual chief marketing officer. I was in the room with the design team when the concepts were being unveiled; the client was elsewhere looking at screen versions and participating via conference call. The client and I loved what we were shown, and I said as much when the call was over. It is too rare an experience, I told the designers, that concepts are so tightly on target the first time around; everything driving towards what we wanted our new website to achieve. Well, they said, returning the compliment, we hardly ever get a creative brief as well written and focused as this one, tapping the briefing document I had sent them before they started their work. If you’re a regular reader of this blog, you will know that I hammer on the necessity of having a clear and articulate strategy for everything you do in marketing. When embarking on a creative project, a creative brief is a mini-strategy for that project. Lots of brilliant creative people can come up with an approach that is arresting; that’s kinda their job. Arresting creative is an essential prerequisite of any communications effort; without it, you will never catch the target audience’s attention in the first place. However, having once captured your audience’s attention, you must then communicate something that is strategically relevant, that meets your audience at its level of understanding, moves the audience to a new level of understanding and, usually, calls for some sort of action to be taken. Any competent creative team can bring together those two pieces — arresting creative and strategically relevant messaging — IF they are given clear directions. It’s your job as a marketer to develop well-written creative briefs that do just that. Otherwise, you may end up with lighthouses on your brochure. Or fluffy kittens. And have no idea why. As someone who runs a creative agency, I’ll add to this that while the creative direction should be clear, it shouldn’t be overly prescriptive. I’ve run into a few where the client basically designed the piece on paper and wanted the designer to execute it, which is an excellent way to make sure everyone is doing the job where they provide the least value. Absolutely agree, Ryan. That’s the other end of the extreme, and equally unfortunate. A good creative brief is not prescriptive; it’s an objectives-based approach that sets out the desired destination and leaves it to the creative team to figure out how best to get there.